At 9:30 am a Babaylan ceremony was conducted as acknowledgement of our ancestry. It was followed by the singing of the U.S. and Philippine national anthems by Samantha and Bernardo Bernardo, respectively; welcome remarks by Cecile Ramos, HIFINC president; Leo Pandac, PhD., program director of Pacific Asian Alcohol and Drug Program; and Brent Cupe, CEO of the Silver Lake Medical Center. Fr. Tran provided the invocation. 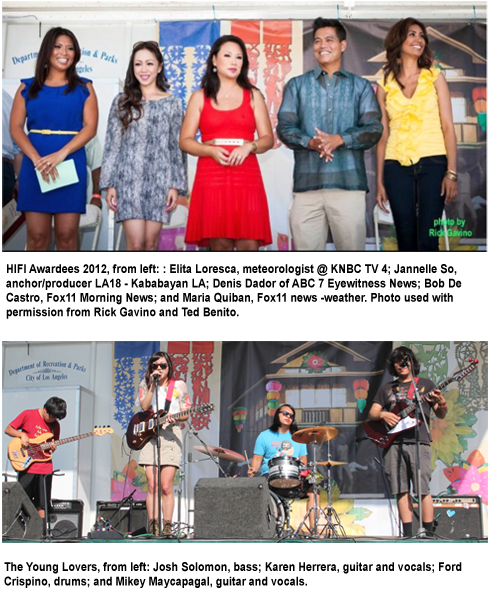 State Senator Kevin de Leon presented the 2012 HIFI awardees, namely: Elita Loresca, meteorologist @ KNBC TV 4; Jannelle So, anchor/producer LA18 – Kababayan LA; Denis Dador of ABC 7 Eyewitness News; Bob De Castro, Fox11 Morning News; and Maria Quiban, Fox11 news -weather. Council member Wendy Gruel presented the medals to winners of the run/walk events. Also presented the Bayanihan Spirit Awards were Ryan Carpio and Fabiole Vilchez. According to producer-director Ted Benito two other HIFI awardees, Cher Calvin and Jean Martirez, expressed their regrets for being unable to come because of other engagements. A tent village inside the walled compound of the medical center showcased Philippine products as well as provided informative materials and services. A stage was also set up where the program was conducted and entertainment numbers consisting of cultural performances, music and dances presented. Among those in the list of performers: The Burlington Tinikling dancers and singers, Gabriel and Abigail Babasa, Classic Harmony, Vangie Crowther, Retz Gajardo, Jr., People’s Core Arnis/Eskrima, Elvis Boy Presley, Ang Lahi Filipino Folk Dance, Sound Mind Project, Osorio Sisters, Eddie Would Tow, Mindstress, Barkada Modern, Samantha Burdador, Silver Lake Adult Daycare folk dancers, Natasha Gil, Young Lovers, Sam Santiago, Claire Rodriguez, and Hidden Hippo. 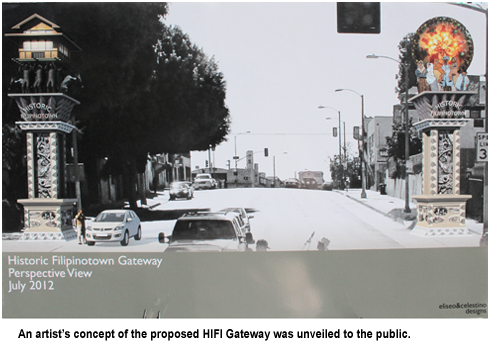 A concept of the proposed HIFI Gateway consisting of two giant pillars by Eliseo & Celestino Designs was unveiled to the public. The left pillar is topped by a depiction of the traditional Filipino bayanihan spirit where neighbors help each other. The pillar on the right side depicts a giant lantern illuminating with hope a representation of immigrants coming to the new world. Vintage photographs of the neighborhood will be displayed elsewhere in the pillars, it was said. 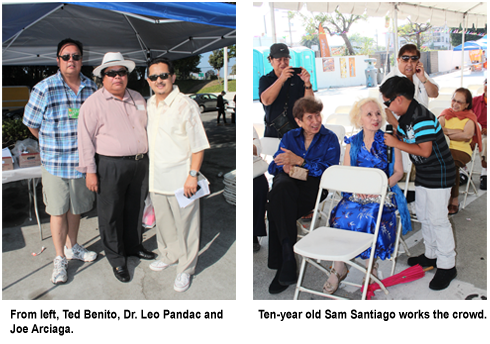 Hosts of the program were Bernardo Bernardo, Alex de Campo, Joseph Gelito and Joe Arciaga. Race director, Jorge Prado.